CIV-Flex cover positioning arm cover. The Laparostat holds a laparoscope and attaches into positioning arm. 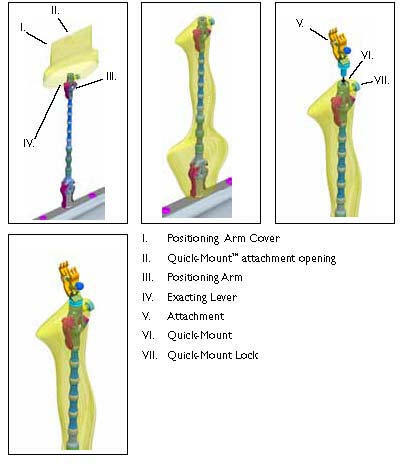 For illustration purposes only, positioning arm and Laparostat may be shown without a cover. Always place a cover over device to protect patients and users from cross-contamination. Do not use if device appears damaged. Positioning Arm Only: Forces exceeding 20lbs. ( 9.07kg ) may move positioning arm when fully locked. 1. Attach positioning arm by turning base handle fully into attachment point. 2. Rotate lever to a desired position. Push base handle lever down to secure positioning arm. 3. Loosen Quick-Mount lock on positioning arm. 4. Insert Laparostat into Quick-Mount, ensuring pin is engaged into locating feature. 5. Tighten Quick-Mount lock on positioning arm to secure. 6. Place cover over positioning arm and Laparostat, using proper sterile technique (See positioning arm cover instruction). 7. Orient positioning arm to desired position. Use exacting lever to tighten arm. 8. 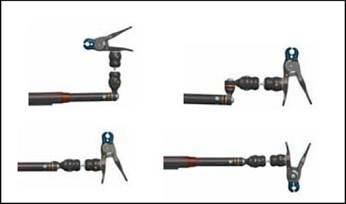 For initial starting position, center telescoping section of Laparostat and position clamp. Reposition laparoscope by grasping the Laparostat at the clamp. 9. Attach clamp to laparoscope as close to camera body as possible, taking care to avoid puncturing cover. Ensure laparoscope is secure. Users of this product have an obligation and responsibility to provide the highest degree of infection control to patients, co-workers and themselves. To avoid cross-contamination, follow infection control policies established by your facility. Do not place in mechanical washer. Do not autoclave or immerse. Sterility of positioning arm and Laparostat can only be achieved by using sterile positioning arm cover. 1. After each use, discard single-use, disposable components. 2. Wipe all surfaces with common germicidal or antiseptic wipe, such as alcohol.